Been quite long time I am not post anything to the blog. Just visiting, reading many great post of my blog friends. It is just because I am busy for my wedding preparation. But Thank you to God, everything has been settled and now just waiting for that great day. Sadly, this evening post would be my last post this year. I promise will come back next year. 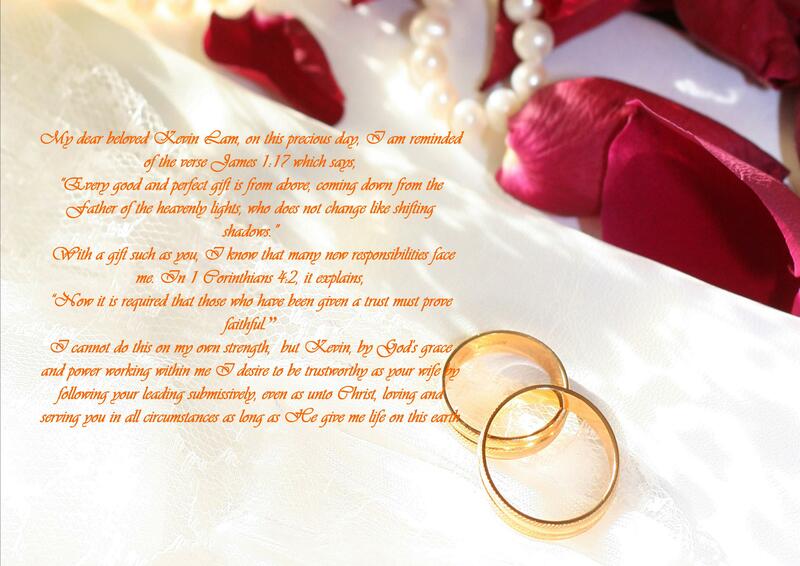 This last post is not an article or my thought but I only share something important part in a Christian Wedding. I would like to share my wedding vow. The most great and important moment in a Christian marriage is when the bride and groom pronounce their wedding vows before God and His congregation. It is the most thrilling and touching moment for them. Utter a vow which is a great commitment not just in the front of husband and wife and their family, but in the presence of God. Few days away, I will say the wedding vow before God and His congregation, as well as in the front of my husband and vice versa. Honestly, I was a bit nervous. Not because I have to memorize the vow but I will says a vow that will be binds of a lifetime and that must be kept for throughout of my life. The wedding vow is a holy vow, a best privilege in life to love and honor my husband forever. It’s the end of a love seeking journey. I pray to God that I could say it clearly and really come out from the deepest of my heart, understand its meaning and prove it by deeds. Below is my wedding vow that I will say on 14th December. This evening I would like to share our wedding vows. For the blog friends who are married, this post might bring you to reminisce, recalling the most precious moment on your wedding day. Many love and blessing to you all. I am gonna miss you so much. My dear beloved Kevin Lam, on this precious day, I am reminded of the verse James 1:17 which says, “Every good and perfect gift is from above, coming down from the Father of the heavenly lights, who does not change like shifting shadows.” With a gift such as you, I know that many new responsibilities face me. In 1 Corinthians 4:2, it explains “Now it is required that those who have been given a trust must prove faithful.” I cannot do this on my own strength, but Kevin, by God’s grace and power working within me I desire to be trustworthy as your wife by following your leading submissively, even as unto Christ, loving and serving you in all circumstances as long as He give me life on this earth.